JCU's Robin Beaman has produced a new map of Australia's Coral Sea region that details the reefs, mountains, and canyons that exist under the sea. Feb 15, 2012: - James Cook University’s Robin Beaman has produced a new map of Australia’s Coral Sea region that details the reefs, mountains, and canyons that exist under the sea. A marine geologist at JCU’s School of Earth and Environmental Sciences, Dr Beaman’s map covers an area of about one million square kilometres of the Coral Sea Conservation Zone, which stretches from the outer-most limit of the Great Barrier Reef Marine Park to the edge of the Exclusive Economic Zone. A major finding that the map details is the large number of underwater canyons in the area as well as 14 mountains, or seamounts rising at least 1000 metres from the sea floor. “One seamount, the Fraser Seamount, is 4060 metres high, nearly twice the height of Mt Kosciuszko, Australia's highest mountain," Dr Beaman said. The large numbers of submarine canyons were found wherever the seafloor gradient exceeded just one degree in slope. It traces the boundaries of undersea, or geomorphic features and they can also be seen in the new high-resolution depth model for the Coral Sea, called the gbr100 grid. "Geomorphology describes the geological shape of the Earth and so geomorphic maps of the seafloor are a useful way to identify the important marine habitats," Dr Beaman said. A Queensland Smart Futures Fellow, Dr Beaman said that in the Coral Sea, there were broad-scale features, such as flat plateaus, bowl-like basins, and long troughs. “Superimposed on these are the finer-scale features, such as canyons, hills and knolls, and the more familiar coral reefs," he said. "There are 41 separate coral reefs in the Coral Sea, with a combined area of about 15,000 square km and a combined perimeter length of 2400 km. "The largest reef, Tregrosse Reefs/Diamond Islets, has a huge area of 3621 square km. There are also currently 56 individual sand cays." The new digital map was generated by hand digitizing polygons for individual geomorphic features within a geographic information system, and then adding the feature names to the polygon database, where names were available. The high-resolution map provides users with an accurate spatial tool for helping to understand the variety and scale of Australia's underwater landscape. 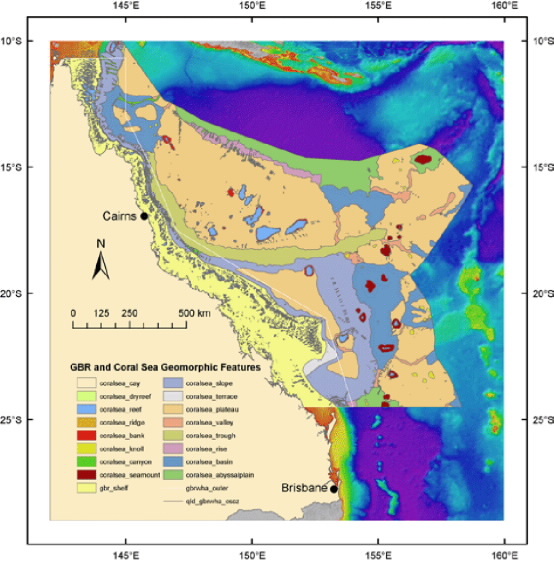 The release of the Geomorphic Features map in a variety of formats coincides with the public consultation period for a Commonwealth marine reserve proposal for the Coral Sea (http://www.environment.gov.au/coasts/mbp/coralsea/index.html). Dr Beaman’s research was supported by a $150,000 Queensland Government Smart Futures Fellowship, and matching grants from the Reef and Rainforest Research Centre and James Cook University. The fellowships are part of the Queensland Government’s Smart Futures Funds, designed to bolster Queensland’s knowledge economy by supporting collaborative research projects, skills development and innovative research throughout the State.